Only the one in the middle doesn’t have a World Championship medal. Vittoria’s Ken Avery is seen here with Greg Minnaar on the left and Dave Cullinan on the right. 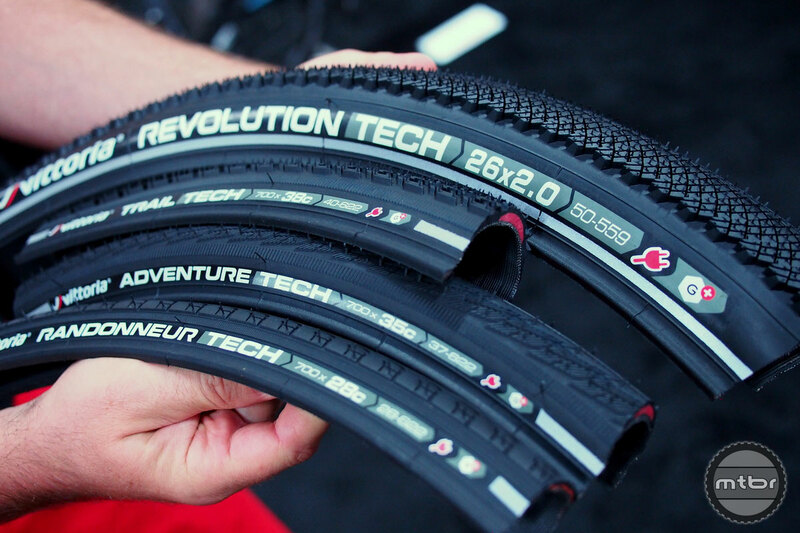 We caught up with Ken Avery of Vittoria tires and he gave us the lowdown on what the future holds for them. 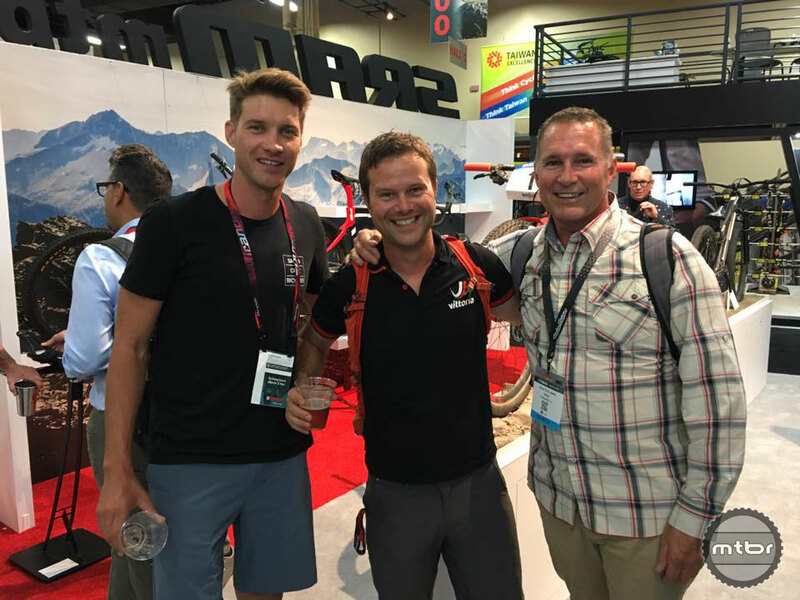 Vittoria is like a breath of fresh air since they are investing significantly in the mountain bike space to improve their product offerings and support the best athletes. They continue to shake things up with original tire designs that and support athletes and events that help grow the sport and stretch its boundaries. Here are some of the products coming in the next few months. The Martello is a big tire with big knobs. Casing is compliant and tough. 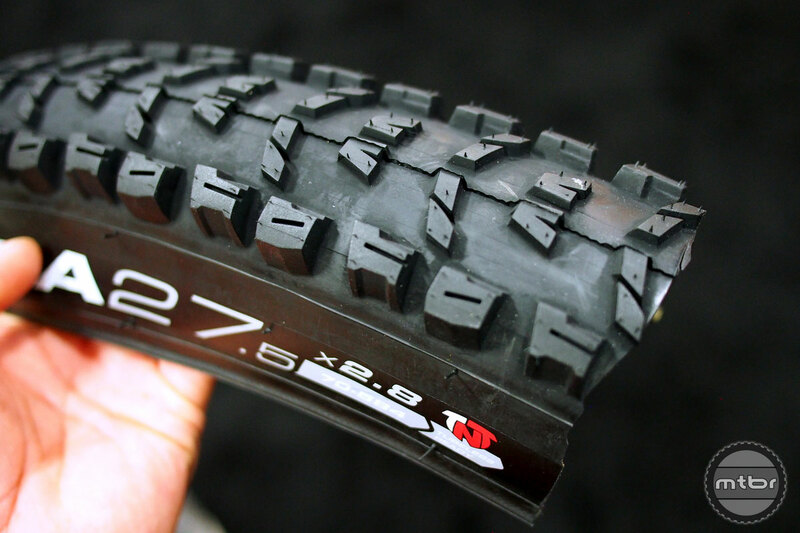 The Vittoria Martello All Mountain tire is going to be offered in 27.5 x 2.6 and 2.8 size. 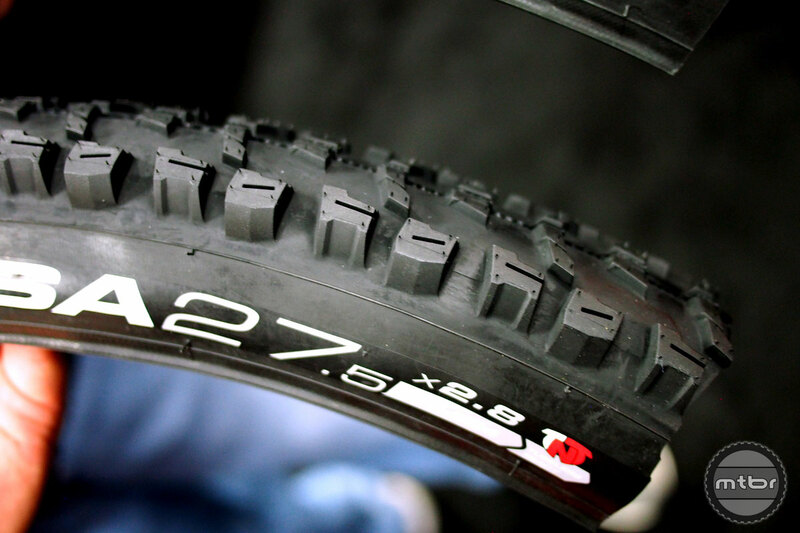 This tire is a favorite of ours since it has significant, trustworthy grip. Side knobs are well supported and the transition while leaning at the limit is very predictable. Brakes and rolls quite well too. Ken Avery says one of the keys is the progressive siping (cuts on the knobs) where the cuts have different widths to deliver more grip incrementally. Good rolling characteristics are surprising for the Morsa. The Morsa will be offered in 27.5 x 2.6 AND 2.8 size. The Morsa is an open design with big, well-supported side knobs. 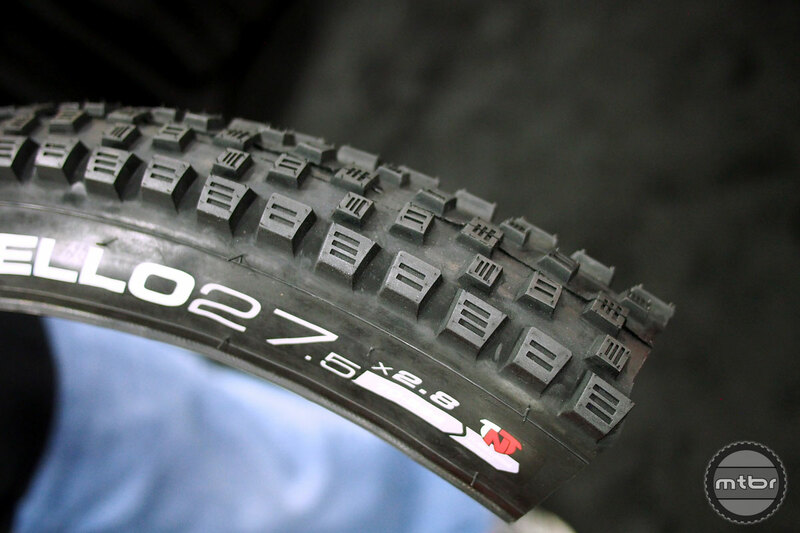 The Morsa has great rubber and design winning Best Of Mtbr honors last year. Well-supported side knobs are key to the Morsa’s cornering. 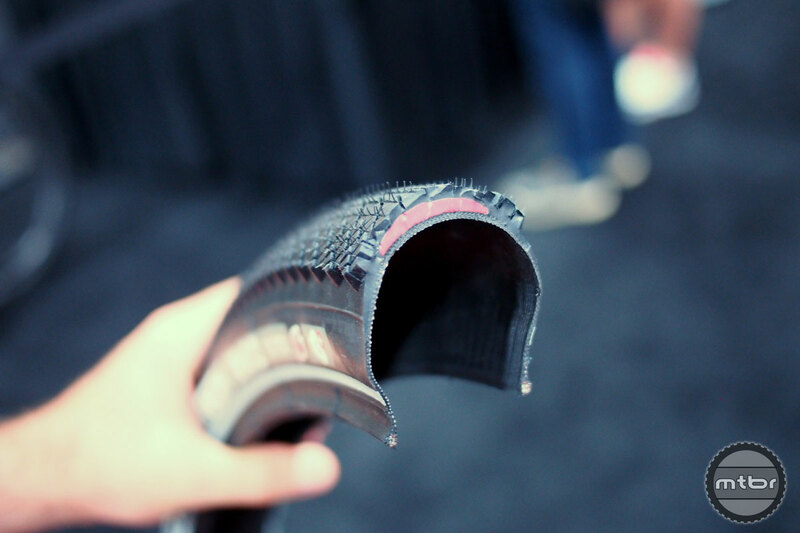 The red lining seen in the cutaway offers good puncture resistance. Ken also showed us some changes for the gravel and commuter line where they offer great price points for tires with good puncture resistance. What’s the weights of these fancy treads? Thinking Martello front / Morsa rear might be pretty darn great. Better than my HRII front / Rekon+ rear combo though?